There are various aspects you need to consider when choosing the best award for your award ceremony. Among many factors are occasion, budget, material, size, style, amount of verbiage, and design concept. This article will help you to navigate through your decision of choosing the optimal crystal award. The most important factor is the occasion for which the award is given. There are common themes of awards appropriate for a particular occasion: sales, achievement, service, donation, recognition, honorary, innovation, motivation, patriotic. 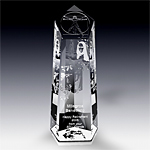 Crystal obelisks and triangle shapes are a popular choice for sales awards. 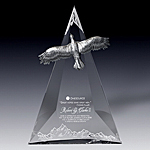 Mountain peaks , obelisks and star award themes celebrate personal and professional achievements. Eagle and flame awards symbolize leadership, loyalty, patriotism, strength and perseverance, which makes them a perfect choice for service or retirement awards. Donations are commonly recognized with crystal plaques or wall plaques . If your award celebrates global achievements, choose from a wide range of our globe awards. Stars and mountain peaks are a popular choice for motivational awards. 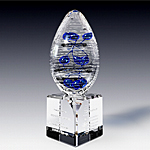 In addition we created a line of sculptural crystal awards that incorporate concepts in their design. The following sculptural awards are tailored for a specific concept: victory , partnership , teamwork , foundation , innovation , key player , key to success , Wall Street , and spotlight . 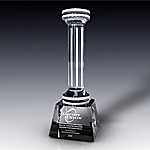 The design of your award can also integrate industry specific elements. For example, choose our establishment tower award or crystal pillar for real estate and construction companies. Crystal truck and airplane awards are perfect choice for transportation and logistics companies. Our selection of crystal awards start from $79. We offer free engraving on all of our crystal awards and trophies . Your additional cost will be shipping charges plus a logo set-up fee of $35 if you choose logo personalization. We also offer a budget award selection for more cost sensitive projects. If your budget is less than $79 per award, we offer the following crystal paperweights that can be used as small awards: cube , pentagon , star , heart . Most of our awards are created from optic crystal . We work with crystal because it is the most prestigious material that manifests excellence, brilliance, purity, perfection. Some of the awards combine hand-crafted bronze and pewter sculptures with crystal bases. Our newest design additions feature unique blue and black crystal. Clear crystal is more traditional. Therefore if the nature of your award is formal, choose clear crystal or a combination of crystal and metal. However, if you are celebrating innovation and you want your award to be cutting edge design, you may consider our unique black crystal awards. Size of the award is determined by a few factors. If you plan to present an award in front of a large audience, choose a larger piece - 8" tall and up, so it will be seen from the podium. Smaller awards will work better for a more intimate award ceremony. In addition, larger awards allow for more personalization space. 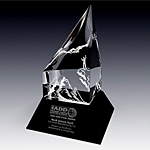 If you have an extensive verbiage, choose a wider and taller award with a generous engraving area. At times people are motivated by various factors other then design when selecting an award for their ceremony. For example, some need an award with a very large etching space or a very tall trophy obelisk. Please read the following information for additional assistance in finding the right award. Choice of verbiage should reflect the nature of the award and your corporate image. Your personalization text can be formal, conservative, informal, funny or personal. Please read our personalization advice article for creative personalization ideas.